So, six films. Four heroes. And now reach the culmination of it all: the end of the first phase of the Marvel Cinematic Universe. This should, by all rights and logic, be the best film in the series yet. It should be the most bombastic and action-filled film in the six so far. The Avengers should be a showcase of every hero introduced into the MCU so far and perhaps set up something bigger. Did it manage to do this? Let’s find out. I’m not even going to beat around the bush with this one, the answer is unequivocally YES. It’s the best film in the series so far. That’s not to say The Avengers is without its flaws, but more on those later. Let’s start on the positives first. The plot is simply great. It’s simplistic, but not too simple. The entire plot revolves around a macguffin (in this case the Tesseract, the cosmic cube introduced in Captain America: The First Avenger). Loki manages to get a hold of it, take control of Hawkeye and several other S.H.I.E.L.D members, and intends on using the Tesseract, which (spoilers) is actually the Space Infinity Stone, to open a massive portal above Stark Tower. It’s up to Captain America, Thor, Iron Man, The Hulk and Black Widow to save Hawkeye, stop Loki and save the world. 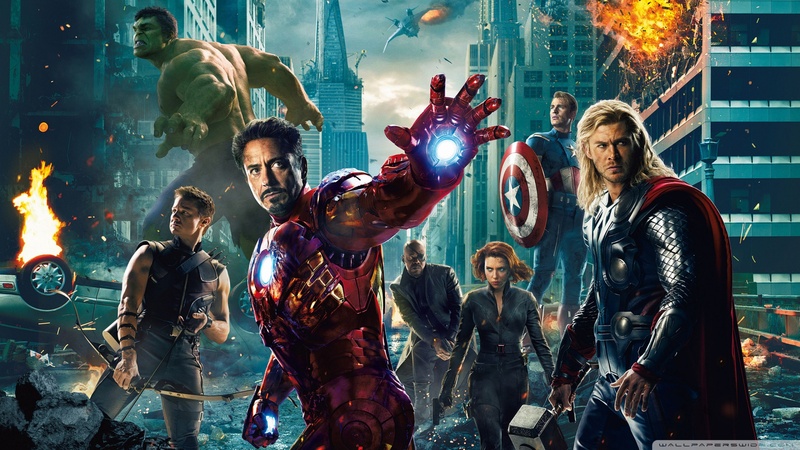 The Avengers is an action film that also somehow manages to be a character study as well. It’s rare for a film to be able to do something like this, be a complete blow-out epic action film yet still find time to focus on the nuances of the characters. Yet, somehow, The Avengers doesn’t have a massively long and dull opening introducing all these characters. This is one of the greatest achievements of The Avengers, the fact that it doesn’t need to really introduce these characters again, because we already know them from their solo movies. All that needs doing is a cursory glance, just something that basically says “Oh this is Thor” or whoever the corresponding character happens to be. The characters may be amazing, and I’ll discuss them further later, but I feel I should address the elephant in the room here. Namely, this is the first live-action team-up of one of the most seminal superhero teams in the entirety of comics. Is the action cool? Does it make you feel like you’re watching comic book characters come to life on the big screen? The answer to this question, dear reader, is pretty simply, four words. HELL YES IT DOES. It’s utterly magnificent. There’s a specific shot during the final battle that you’ve probably already all seen, the panning shot around The Avengers fighting together that’s completely and utterly amazing, I absolutely love it. And the action elsewhere is just so good, it’s almost hard to put into words. So I’ll sell you on it like this. You get to see Iron Man reflect his laser off Captain America’s Shield. The characters are also great. You get to see Captain America and Iron Man clash, setting up the seeds of their later clashes in Age Of Ultron and Civil War. You get to see Thor and Hulk fight, with the latter absolutely battering the former. But, most importantly, when the characters are out of the fight it never feels boring. You always feel entertained by these characters, because the actors who portray them are so charismatic. As mentioned in my Iron Man review, Robert Downey Jnr IS Iron Man, he’s just utterly perfect as the character and he’s exactly the same here. Chris Evans is phenomenal as Captain America, Chris Hemsworth is great as Thor and Mark Ruffalo is superb in his introduction as Hulk, striking a balance between causing unease and just being that friendly nerd. There are four characters in particular, however, who get the chance to really shine in this film, where their previous appearances did not allow them to do that. These characters are: Samuel L Jackson as Nick Fury; Jeremy Renner as Hawkeye; Scarlett Johannsson as Black Widow; Clark Gregg as Phil Coulson. All are good here, but if I had to pick a personal favourite, it’d be Clark Gregg’s Phil Coulson. His character just breaks my heart every time I rewatch this film. Overall, The Avengers is a great film, with a few flaws, such as the fact the film slows down considerably for a chunk of the second act. But the film is good, and it’s so fun to see childhood heroes fighting alongside each other in a big-budget movie, that such flaws are easily ignored.